Â Engineered wood flooring has many advantages over solid hardwood that make it very appealing. 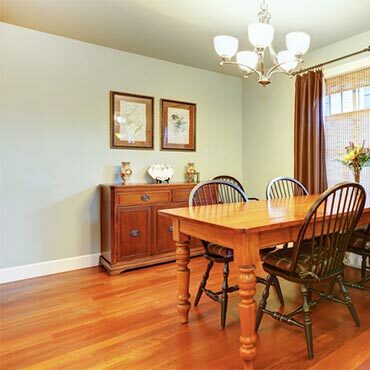 For one thing, engineered wood flooring is not as expensive as solid hardwood flooring. Engineered is actually produced with three to five layers of wood with the top layer being the genuine hardwood. Each layer is stacked in a cross-grain configuration and bonded together under heat and pressure in a factory setting. As a result, engineered wood flooring is less prone to be affected by changes in humidity and can be installed on all levels of the home. The other layers of the engineered wood flooring are usually plywood or high density fiberboard.Â Engineered wood floors will not contract or expand with changes in temperature and humidity as solid hardwood does. Engineered wood flooring can be installed over just about any type of existing floor and is very adaptable to a number of diverse applications. For example, an engineered wood floor can be installed on a concrete sub-floor and below grade, either as a floating floor or a direct glue-down.Â Engineered wood flooring is also an exceptional choice for geographical locations with higher moisture and humidity levels.Â Nevertheless, engineered wood does not perform well in rooms of the home where there is an abundance of moisture and humidity, such as in mudrooms and bathrooms. Engineered plank flooring can also be installed over a radiant heat source. Veteran installers vigorously discouraged radiant heating when using solid hardwood, but it is not a problem under engineered plank floors. One of the foremost reasons that many homeowners choose engineered plank flooring is its incredible price. You have the same texture and look of hardwood, but it seems as if you are getting the hardwood at a bargain price. Engineered plank floors are easy to install, do-it-yourself flooring option with the instructions clearly printed inside each carton. Even so, you do have to make sure that the sub-floor is clean of dirt and dust before you begin so that any small pieces of debris wonâ€™t work their way up through the flooring. Engineered plank flooring comes in various types of wood, finishes and stains. You can also choose unfinished or pre-finished hardwood, but if you are looking for an trouble-free project, then it is best to go with pre-finished. This way after you have the engineered wood floor installed, you donâ€™t have to hassle applying any finish or stain. You can just sit back and take pleasure inÂ your engineered wood flooring.